Academy-Award®-winner Robert De Niro and Academy-Award®-nominee Edward Norton deliver powerful performances as a seasoned corrections official and a scheming inmate whose lives become dangerously intertwined in this thought-provoking drama. As parole officer Jack Mabry (De Niro) counts the days toward a quiet retirement, he is asked to review the case of Gerald “Stone” Creeson (Norton), in prison for arson. 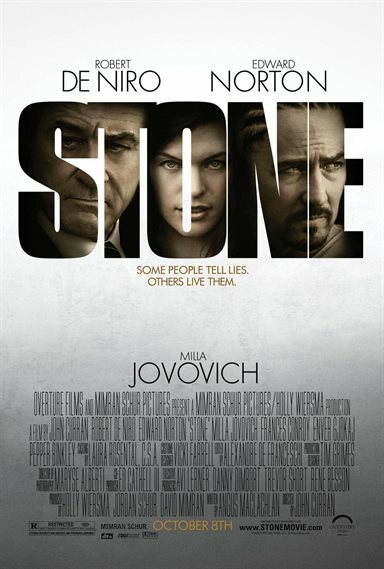 Now eligible for early release, Stone needs to convince Jack he has reformed, but his attempts to influence the older man’s decision with his wife Lucetta (Milla Jovovich of THE RESIDENT EVIL series) have profound and unexpected effects on them both. This tale of passion, betrayal, and corruption skillfully weaves together the parallel journeys of two men grappling with dark impulses, as the line between lawman and lawbreaker becomes precariously thin. Download Stone in Digital HD from the iTunes store. Stone images are © Overture Films. All Rights Reserved. 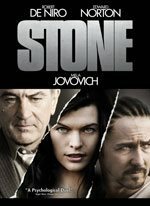 Stone is a film starring Edward Norton, Robert De Niro and Milla Jovovich, about a man who is nearing his parole hearing and attempts to manipulate the system so he is guaranteed freedom but along the way undergoes a spiritual epiphany. The film opens with a young couple who live a modest life somewhere in Midwest America. Right from the start anyone can tell that there is something missing from this family and that namely is joy. The husband sits still in his chair mindlessly watching a golf tournament on TV not bothering to notice anything his wife does or says. His wife, obviously miserable is coming to a realization about the life she is leading. In her attempt to signal to her husband that she wants out he makes a truly horrifying and desperate attempt to keep her from leaving and it works. Years later we see that same couple now in the twilight of their years. Jack Mabry, played by De Niro, is a parole officer who is on his way to retirement and only has a few months to go. He is in the final stages of wrapping up his case files but happens to start up with one last inmate, Gerald "Stone" Creeson, played by Edward Norton. Norton, who has over the years proven over the years that he is one of the most diverse actors of our generation, comes full force with his portrayal of this character. He delivers the dialogue with a low scratchy sound that you almost wonder if he was spending his off camera scenes shouting to achieve such an affect. As their interviews get under way you can tell that Mabry has seen and heard it all from the inmates over the years so he doesn't expect much from Gerald initially and like all inmates nearing their parole hearing Stone does his best to convince Mabry that he has reformed and should be allowed to integrate back into society. Once the film has established the relationship between these two people it begins to show the contrast in their lives as they go about their day. It's clear from the start that Stone, besides giving Mabry what he wants to hear, is willing to do whatever it takes to guarantee his parole, even so far as to enlist his wife. Stone's wife, Lucetta, played by Milla Jovovich, does a phenomenal job coming off as someone who clearly does what she wants when she wants. Things become even more complicated though when the hardship of prison life finally has a profound effect on Stone's mental state. Witnessing a prison murder causes Stone to begin to see the life around him in a new way. This causes complications with the plan he and his wife have enacted even though she is willing to follow it through to the end. She seduces Mabry and in doing so manipulates him into tweaking Stone's file so it when it goes before the review board he will be paroled. While this is what Stone initially wanted he now looks at his own life in a different light and with that comes new realizations about himself. The stands out performances here really are Jovovich and Norton. Norton, as always, is able to make a character convincing, scary, sad and somehow familiar all at the same time. Jovovich, who mainly has action films to her credit, shows more depth than what we're used to. She takes a simple character and adds a level of deviousness that is unexpected. De Niro on the other hand doesn't really bring much to his role, for the whole movie he just comes off as very uninterested or interesting which makes it difficult to watch as he plods along through each scene. Overall though his performance doesn't detract from the film on the whole; the only real drawback is the conclusion. You have to wonder if perhaps the writers had trouble coming up with a more rounded ending which is why they went with an open-ended one. Regardless, Stone is an entertaining film about the consequences of our actions, and faith in the idea that there is a larger purpose to life.